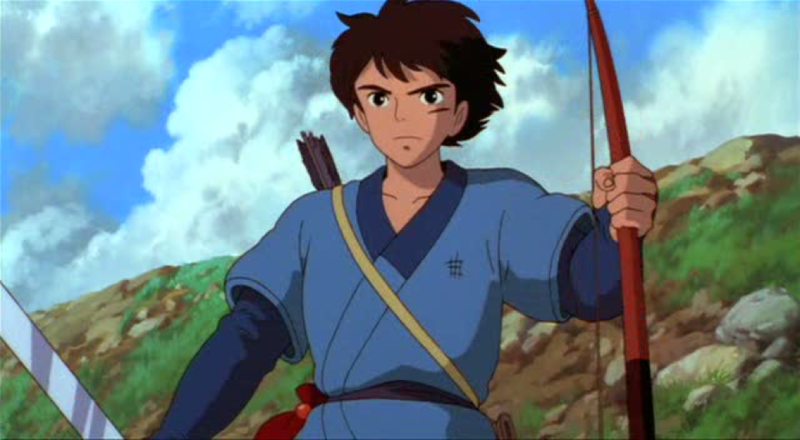 Ashitaka is the main protagonist in the 1997 Studio Ghibli film Princess Mononoke. He is the prince of an Emishi village who, after being cursed by a demon boar, travels to the west to seek a cure and prevent his curse from falling onto another. He is a prince of the Emishi people, a once great tribe now reduced to a single village.As an attractive young man admired by his village, Ashitaka undoubtedly has no shortage of female admirers. However, so far no one has caught Ashitaka’s eye. As the prince of a shrinking tribe, Ashitaka was raised with special care, guided by both the village elders and their wise woman, the Oracle. Consequently, Ashitaka has become a young man with both formidable leadership skills and a strong concern for others. Finding a cure for his curse. This is no simple task, as Ashitaka seeks to confront the evil that caused his wound and “see with eyes unclouded by hate.” Whether doing so will cure him is beyond Ashitaka to say. At the sight of San, a girl raised by wolves and whom the locals dub “Princess Mononoke,” Ashitaka is instantly drawn, out of both attraction and curiosity. Kind, calm, and possessing spiritual fortitude and wisdom beyond his years. Deeply respectful of both his elders and forest spirits, Ashitaka is strong, but not violent; compassionate, but not overly ingratiating; and gentle, but not passive. While fairly composed, Ashitaka does have a temper and it is only made worst by his curse which prompts him to act on his darkest thoughts when enraged. Fortunately, this is prevented by his sense of restraint that allows him to control himself in spite of the overwhelming power of the curse, which had previously caused him to kill a bandit. Ashitaka is a brave and talented guy. Maybe not a girl is not attracted to him, what about you? Do you like Ashitaka? If so, try visiting Princess Mononoke merchandise, Maybe you can create your own Ashitaka story. Newer How long was Chihiro in the spirit world ?